CVMAYA Bali Official blog with online catalog of accessories, handicrafts and furniture made in Indonesia such as Lombok, Bali and Java. Home decors and ornaments for home, garden and outdoor including house or office landscape decorations. CV MAYA BALI is manufacturer and factory in Bali and Java (Yogyakarta). We keep stock in our shop and made to order. Jewellery displays made of wood from Bali Indonesia. Wooden bust to use as necklace holders or store fixtures to showcase your costume jewelry or fashion accessories from Bali. Wholesale jewelry displays and supplier located in Bali. We're wood jewelry displays factory in Bali. 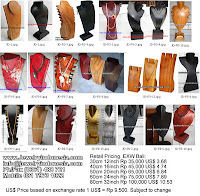 Wooden busts necklace holders store fixtures or showcase factory in Bali. Carved wood busts in various sizes from 30cm 12inch to 2 meters. Suitable to displays your necklaces, bracelets, rings and earrings. All wood busts from Bali, direct from jewelry holders supplier company. We export worldwide. www.Balifurnish.com. Simple theme. Powered by Blogger.